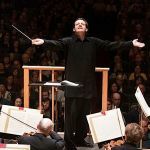 WHRB Classical's Topher Colby reviews the Boston Symphony Orchestra's performance of Mahler 5 from November 16th, 2018. WHRB producer Joyce Lu reviews the BSO's October 27th performance Mahler’s Symphony No. 2, "Resurrection." The performance featured soprano Ying Fang, mezzo-soprano Bernarda Fink, and the Tanglewood Festival Chorus, and opened with Maija Einfelde’s Lux aeterna, for mixed chorus, performed by the Tanglewood Festival Chorus led by James Burton.